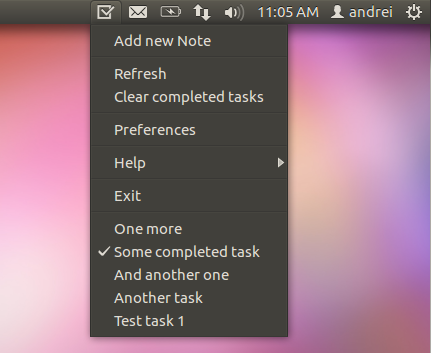 Google Tasks Indicator is a new appindicator that displays your 10 most recent Google tasks on the Ubuntu panel. For now, Google Tasks Indicator supports adding new tasks, marking tasks as completed (or unmark them) and clearing completed tasks. This is the first version, released for testing purposes, so there are still things not yet ready, like editing tasks, selecting the list, configuring the number of tasks displayed and so on, but these features should be available soon. Also, for now Google limits the Google Tasks Indicator API to 5000 hits per day, but hopefully this limit will be increased. Google Tasks Indicator uses OAuth2 so your credentials are not stored locally. The first time your run Google Tasks Indicator, a new tab opens in your web browser, prompting you to grant Google Tasks Indicator access to your tasks. After this, Google Tasks Indicator should start and display your 10 most recent Google tasks. From its preferences, you can set if the application should start automatically when you log in and the icon theme used. If you want to use Google Tasks Indicator with a different Google account, you'll have to revoke the access for the currently logged in user via Google account settings.